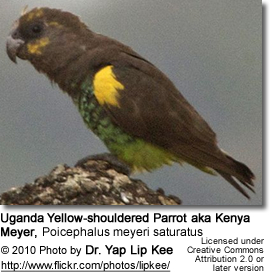 The Meyer's Parrots or Brown Parrots (Poicephalus meyeri) are small, stocky African parrots that occupy most non-coastal areas south of the Sahara (central and eastern Africa). This species was named after the German naturalist Berhard Meyer. In the wild, they are the smallest and most common of all Poicephalus parrots. 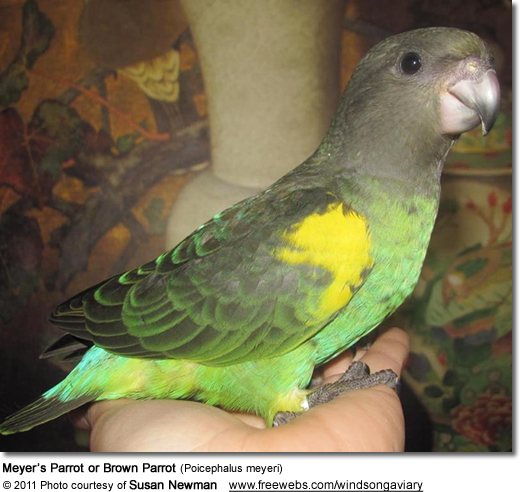 In recent years, these parrots have gained popularity in the pet trade and are imported in large numbers. In the United States, this species may be second only to the Senegal Parrot in terms of numbers held by breeders. This species is, however, a rare find in Australia. Their maximum recorded lifespan in captivity is just under 35 years. This species has been the most challenging to separate into subspecies and is possibly split up into six subspecies based on home range, size and markings, including extent of yellow markings on the head and wings, as well as intensity of blue, turquoise or green markings on the abdomen or rump. The western races P. m. damarensis and P. m. reichenowi lack yellow markings on the head. There is some controversy about the validity and identification of the subspecies. Many conflicting identification reports have been published on this topic. The natural range of these birds overlaps to such an extent that interbreeding has undoubtedly occurred in the wild. Unfortunately, captive birds are often impossible to classify as they are commonly interbred - one major reason being the unavailability of a true and unrelated species mate as well as a lack of understanding of the different sub-species. In order to preserve the sub-species, it is hoped that breeders make an attempt at matching up same-species birds. They are from central and eastern sub-Saharan Africa - an extremely large land mass. Specifically, these parrots can be found in Southern Chad, northeast Cameroon, Central African Republic, as well as the southern Sudan and western Ethiopia. They appear to be most prolific in Zimbabwe and northern Botswana. There was no evidence to support any local migrations. 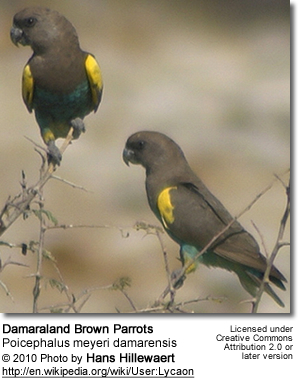 Like Senegal Parrots, the Meyer's Parrots inhabit the moist woodland areas, the edges of the dry savannah, wooded grasslands, forests along watercourses and agricultural land - up to 2200m (7216 ft). On occasion, they are also found in suburban areas. They are usually seen in pairs or small flocks; however, occasionally large gatherings of up to 50 of them are observed in favored feeding areas. These shy and wary birds roost in tree cavities. 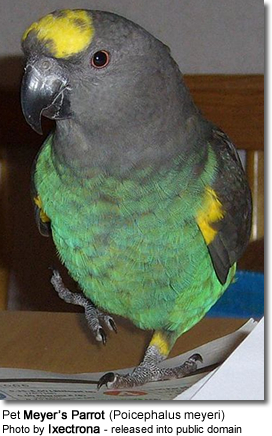 This is a small and stocky African parrot, averaging 8 - 10 inches (21 - 25 cm) in length. Their wing length is about 5.5 to 6 inches (141 - 149 cm). They weigh about 3.5-4.7 oz or 100-135g. They are similar in shape and size to the Senegal, Brown-headed and Red-bellied Parrots. Like the Red-bellied Parrots, they have orange-red irises. The plumage is mostly brownish-grey with yellow patches on the bend of the wings and thighs and - depending on the subspecies - also on the head. Their abdomen is green and the rump is blue or turquise. The upperside of the tail is brown and the underside is dark grey. Their feet are dark grey. The eye (periophthalmic) rings are black and the bill is black. Females look like males, and if gender identification is important (for example for breeding birds), DNA / Feather or surgical sexing is recommended. 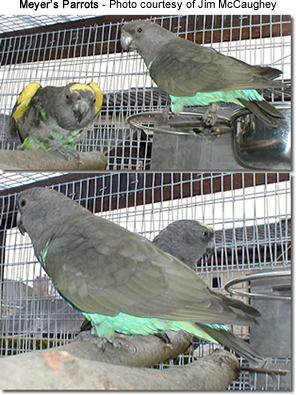 Some visual sexing can be attempted using the same method as for the brown-headed parrots: the male has a larger beak, larger head and the head tends to be flatter on top. Young / immature birds are generally greenish-brown without the yellow crown and thighs. The lower breast and abdomen are green. The yellow on the bend of the wing is less extensive. Their under wing-coverts are brownish-green and interspersed with yellow. The lower back is blue. Young birds have dark brown irises. They attain the adult plumage when they are about 12 months old. Their contact calls consist of a series of screeches, often with brief pauses. Their alarm calls start with a growl and escalate into shrieking cries. Captive birds mimic sounds around them. Their natural diet includes fruits, berries, flowers, seeds, nuts, as well as the occasional insect. They may also forage on cultivated crops. 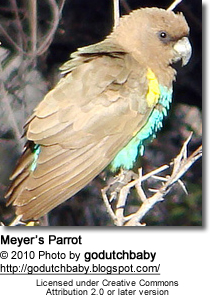 Meyer's parrots are relatively common in the wild and, as such, are classified as Low Risk / Least Concern on the IUCN Red List. However, even though they are not considered globally threatened, their populations have dramatically decreased in South Africa and Zimbabwe, mostly due to habitat destruction and persecution owing to damage of crops. They are also heavily trapped for the pet trade, which contributes to their declining numbers. Distribution: Northern and central Angola as well as adjacent areas of Congo. 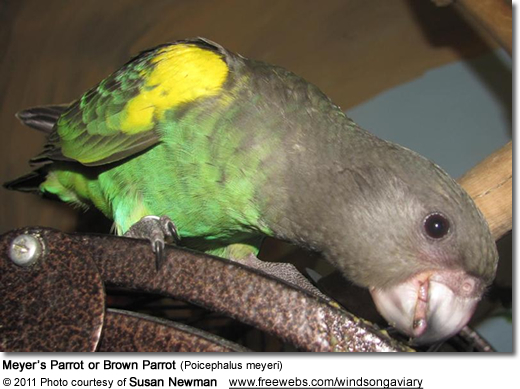 Species: Scientific: Poicephalus meyeri matchiei ... English: East African Brown Parrot ... Dutch: Oost-Afrikaanse Meyers Papegaai German: Ostafrikanischer Goldbugpapagei ... CITES II - Endangered Species . Distribution: Northeast Mozambique, Zimbabwe and eastern Lesotho; isolated population in Cape Province, South Africa probably originated from escaped birds.